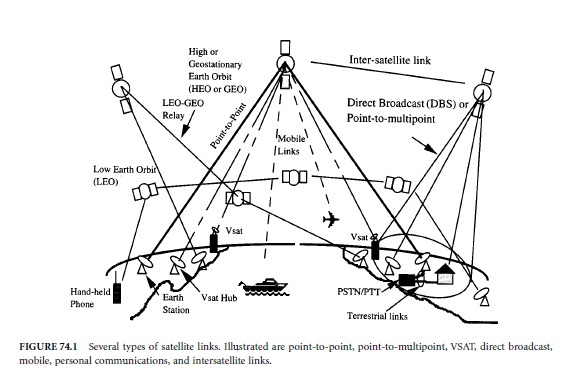 Figure 74.1 depicts several kinds of satellite links and orbits. The geostationary earth orbit (GEO) is in the equatorial plane at an altitude of 35,786 km with a period of one sidereal day (23h 56m 4.09s). This orbit is sometimes called the Clarke orbit in honor of Arthur C. Clarke who first described its usefulness for communications in 1945. GEO satellites appear to be almost stationary from the ground (subject to small perturbations) and the earth antennas pointing to these satellites may need only limited or no tracking capability. An orbit for which the highest altitude (apogee) is greater than GEO is sometimes referred to as high earth orbit (HEO). Low earth orbits (LEO) typically range from a few hundred km to about 2000 km. Medium earth orbits (MEO) are at intermediate altitudes. Circular MEO orbits, also called Intermediate Circular Orbits (ICO) have been proposed at an altitude of about 10,400 km for global personal communications at frequencies designated for Mobile Satellite Services (MSS) [Johannsen, 1995]. LEO systems for voice communications are called Big LEOs. 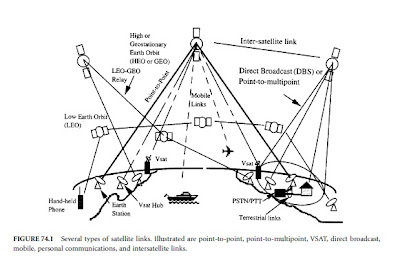 Constellations of so-called Little LEOs operating below 1 GHz and having only limited capacity have been proposed for low data rate non-voice services, such as paging and store and forward data for remote location and monitoring, for example, for freight containers and remote vehicles and personnel [Kiesling, 1996]. Initially, satellites were used primarily for point-to-point traffic in the GEO fixed satellite service (FSS), e.g., for telephony across the oceans and for point-to-multipoint TV distribution to cable head end stations. Large earth station antennas with high-gain narrow beams and high uplink powers were needed to compensate for limited satellite power. This type of system, exemplified by the early global network of the International Telecommunications Satellite Organization (INTELSAT) used Standard-A earth antennas with 30-m diameters. Since then, many other satellite organizations have been formed around the world to provide international, regional, and domestic services. As satellites have grown in power and sophistication, the average size of the earth terminals has been reduced. High gain satellite antennas and relatively high power satellite transmitters have led to very small aperture earth terminals (VSAT) with diameters of less than 2 m, modest powers of less than 10 W [Gagliardi, 1991] and even Smaller ultra-small aperture terminals (USAT) diameters typically less than 1 m.
Terminals may be placed atop urban office buildings, permitting private networks of hundreds or thousands of terminals, which bypass terrestrial lines. VSATs are usually incorporated into star networks where the small terminals communicate through the satellite with a larger Hub terminal. The hub retransmits through the satellite to another small terminal. Such links require two hops with attendant time delays. With high gain satellite antennas and relatively narrow-band digital signals, direct single-hop mesh interconnections of VSATs may be used.